Aug 27, 2015 (LBO) – Sri Lankan apparel exporter Brandix says it plans to allocate five million rupees for each ‘model village’ it supports with improved water supply and sanitation facilities under its corporate social responsibility program. The villages are selected within a five kilometre radius of its factories, initially in Polonnaruwa. The program has contributed to nine schools in the district and the Kaduruwela police station, Anusha Alles, Head of CSR of the Brandix Group, said. This model village approach is inspired by the ancient concept of village life revolving around the tank, the temple and the school. So far, three schools, Athumalpitiya Primary School, Sewamuktha Kandaura Navodya Maha Vidyalaya and Nagara Maha Vidyalaya, have received drinking water facilities. 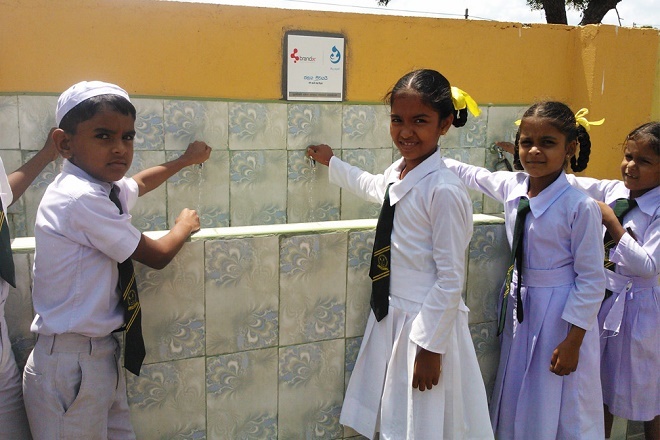 Six schools – the Galthabarawa Primary School, Wijayaraja Vidyalaya, Palugasdamana Maha Vidyalaya, Palugasdamana Primary School, Bandiwewa Maha Vidyalaya and Ananda Jayasekara Nursery – received assistance to build or repair their toilets and sanitation facilities. The Kaduruwela police station received a new block of toilets for the use of its staff and visitors. Brandix said its CSR effort is driven by the central theme of ‘Water’ and is a commitment to increase the provision of safe drinking water to those most in need.